There are 12 non-profit colleges and universities in Nevada, so whether students are drawn to the northern or southern part of the state, they are likely to find a Nevada college that suits their academic and personal interests. Most non-profit colleges in Nevada are public, but areas like Henderson and Incline Village offer private institutions as well. Prospective students can use this guide to discover more about Nevada's higher education system and find the right school for them. Learn about the real cost of college in Nevada, the state's best and most affordable schools and assistance programs for Nevada students. 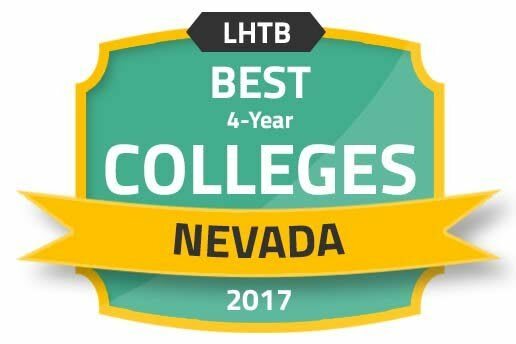 Prospective students can get an idea of what Nevada has to offer by checking out this list of top colleges in the state for the 2017-2018 school year. Rankings are determined by a combination of factors, including tuition, student-to-teacher ratio, financial aid packages and graduation rates. Students who don't find the right college for them in this list can use it to gauge the quality of other Nevada schools. Finding the right Nevada college doesn't have to mean sorting through endless "About Us" pages on college websites. Prospective students can use this search tool to find college matches by filtering for cost, student population, types of schools and available degrees. Users can also make side-by-side comparisons to find a Nevada college that meets their financial, academic and lifestyle needs. Nevada is working on improving its accessibility to higher education through a variety of initiatives and financial aid programs. Along with longstanding scholarship and grant programs like the Millennium Scholarship and newer college planning programs for parents, the Nevada System of Higher Education is pushing to become more adept at serving students of all needs and backgrounds, to increase accessibility to low-income students, and to help students finish college with less debt. Nevada's higher education system has adopted the 15 to Finish initiative to help college students finish their degrees on time. By pushing to make 15 credits per semester the norm for full-time students instead of 12, the Nevada System of Higher Education hopes to see more students graduate on time with less debt. The program encourages students to meet with their academic advisors to make complete course schedules for the length of their programs of study so they can stay on track. Every year since 2014, the Cultural Diversity Committee at the University of Nevada, Reno has hosted a conference to discuss diversity and equity within the state's higher education system. Through a keynote speech, panel discussion and nearly 80 presentations, including workshops, the summit aims to raise awareness and improve higher education access for students of all backgrounds. Attendees can publicize and discuss research, network and establish relationships, share resources, identify needs and goals pertaining to higher education, diversity and equity, among other things. The event is two days and is free to the public. The Silver State Opportunity Grant Program (SSOG) aims to help low-income students afford college. The program was created in 2015 on a shared responsibility model: the total cost of college, including tuition, books, room and board and other costs of living, could be shared between the state, the federal government, the student and the student's family. Through the program, need-based grants are awarded to students attending community or state colleges within the Nevada System of Higher Education. Awards are calculated by taking the total cost of attendance and subtracting student, family and federal contribution. The SSOG takes care of the remainder. The sticker price of tuition isn't always an accurate representation of what students pay to attend college. Having an idea of how likely they are to receive financial aid and how much they will be awarded can give prospective students a clearer picture of the real cost of attending a Nevada college. Check out the following charts to see how Nevada compares with the national average for tuition rates, financial aid packages and percent of students receiving aid. Nevada is working on making higher education more affordable to its students through new and established financial aid programs. When combining the aid from these programs with federal financial aid, the cost of attending college in Nevada can be vastly different from the advertised price. These six colleges are the most affordable in the state based on net price, or cost of attendance minus financial aid. Starting a good career upon graduation can be difficult, but getting there helps graduates tackle any loans taken out for college and gain financial stability. The schools below turn out Nevada's highest paid alumni 10 years after beginning their degree programs. Check them out along with how average earnings for Nevada alumni compare with those nationally. Debt is often a very real issue for recent college graduates, but the right combination of affordable tuition, financial planning services and state aid can help lighten the load. These Nevada colleges leave their students with the least amount of debt upon graduation. It's important that prospective students not only look at the cost of college but also the general cost of living wherever they plan to attend school. Rent, utilities, groceries and transportation can all affect the affordability of attending college. The cost of living in Nevada is right around the national average, which may be encouraging for many. Prospective students can reference the following tables to learn cost of living specifics for Nevada and its major metro areas. Prospective students should be sure to look for accredited Nevada colleges when conducting their school search. Accreditation is a voluntary, self-regulatory process that institutions can undergo to show that they meet quality assurance standards in various areas, like teacher qualifications and program development. Accreditation also gives institutions and their students access to federal funding. For schools, this means support for teachers and research. For students, this means access to federal financial aid. Students can look for both regional and programmatic accreditation. The regional accrediting body for Nevada is the Northwest Commission on Colleges and Universities. Accreditation Board for Engineering and Technology (ABET) accredits the chemical, civil, materials, mechanical, environmental and electrical engineering programs at the University of Nevada, Reno. Association to Advance Collegiate Schools of Business (AACSB) accredits the economics, entrepreneurship, international business, finance, marketing, management, real estate and urban economics, applied economics, M.B.A. and Executive M.B.A. programs at the University of Nevada, Las Vegas. Southern Nevada has a handful of higher education options, but like Reno, Las Vegas proper has only two primary, not-for-profit colleges. The College of Southern Nevada and the University of Nevada, Las Vegas are public institutions that provide students with a variety of degree and certificate options, like kinesiological sciences, paramedic medicine and hospitality management. Students who attend college in Las Vegas also have the advantage of being surrounded by many large industries that provide internship and job opportunities. UNLV is a public research institute founded in 1957. The university offers over 350 degrees in 146 programs of study and is working toward becoming a top tier public university in research, education and community impact by 2025. Around 23,800 UNLV students are undergraduates, and about 4,800 are graduate students. Those who attend UNLV get to enjoy over 300 student organizations and are only a few miles away from Lake Mead, the Hoover Dam and the Colorado River. The College of Southern Nevada is the state's largest and most ethnically diverse college. This public institution boasts over 160 degrees in more than 70 different areas of study. With three main locations, an early high school program, multiple centers within southern Nevada and 23 degrees and certificates available entirely online, CSN students are sure to find a program that meets their needs. Students can also participate in a variety of clubs, organizations and sports teams. Reno is home to two main colleges: the University of Nevada, Reno and Truckee Meadows Community College. While this may seem limiting at first, both the four-year and two-year institution offer an array of degree and certificate programs, including over 40 Ph.D. options for graduate students. Students who want to pursue graduate or undergraduate degrees related to environmental research, earth and environmental sciences, hydrologic sciences or atmospheric sciences also have the benefit of the Desert Research Institute (DRI) right next to TMCC and a few minutes from UNR. DRI faculty often work with UNR classes and offer internships and assistantships. Founded in 1874, UNR is public research university with 145 degree programs, more than 250 student clubs and organizations and an array of sports teams. UNR also offers over 200 online courses each year and has one of the nation's largest study abroad programs, so students can learn almost anywhere. The campus is settled on the outer edge of downtown Reno, minutes away from the Truckee River and a short drive from Lake Tahoe and Mt. Rose. Truckee Meadows Community College serves over 25,000 students at five campus locations and over 20 community centers. The school offers credit and non-credit programs in over 50 career areas and has transfer agreements between UNR, UNLV and Nevada State College, making it easy to transfer to four-year Nevada colleges. TMCC also has a high school that allows junior and senior students to earn college credit up to an associate degree while earning their high school diplomas. A comprehensive source for students in elementary through high school on various aspects of attending college in Nevada, from how to get started planning for college, to career and financial planning guides. Information regarding the Millennium Scholarship Program, including eligibility requirements and how to apply. The education section of this Las Vegas newspaper provides information and updates about southern Nevada's education system. Learn about education opportunities for adult learners in Nevada. A federally funded grant program designed to help young, low-income students gain awareness of higher education and be prepared to succeed in college programs. The hub page for Nevada's higher education system. Provides a variety of information about schools, financial aid programs and other statewide initiatives. The Reno newspaper's education section. Stay up-to-date on changes and events within northern Nevada's education system.